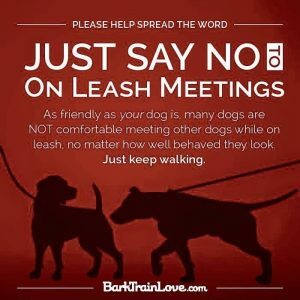 There’s a few memes going around advising to “just say no” to on-leash greetings. Largely I agree – if possible, regardless of how “friendly” either dog is or isn’t, a leash does not allow a dog to display normal behaviours. They can’t flight, they can’t fight well, and even freezing doesn’t work when another dog is right there in your face. This is can create leash reactivity and a form of barrier aggression. In reality, with our leash laws, when we’re out & about walking it is a scenario we might encounter a lot. We can’t always avoid it. And always trying to avoid it makes it even more stressful when it does happen, and means neither we nor our dogs learn how to handle them. So before we know it we’ve got two dogs tangled in leashes, freaking out, maybe fighting, and it’s a mess. If possible, circle slightly on the approach so you are not approaching straight on. It is commonly believed that dogs don’t naturally approach another dog straight on as they will circle as if to sniff in the nether regions. While this actually seems to be a myth, if you can circle slightly in the approach it may be less confronting. Be aware of the leash, and handle it well. Putting additional pressure on the leash can easily translate to the dog as tension, and adding tension to a greeting is not ideal. Don’t let leashes get tangled. This is easier said than done with dogs circling to sniff, but if they’re getting tangled the tension is increasing and the dogs are getting stuck. Keep the leash loose and keep watch to make sure no tangle happens. Know your dog. Know their communication style and the subtleties they have. Know what it looks like when they are unsure or being overbearing or ready to play. Most dogs have an initial sniff and then display one of those communicators, and at the first sign that sniffing is over you need to disengage. I’ve heard of a 3-second rule – I find every dog is different in every encounter, so rather than focus on counting watch what your dog is saying instead. Use gentle leash pressure to steer your dog away, along with whatever your keep moving cue is. Practice, practice, practice. Practice your leash handling skills. Practice your dog’s impulse control exercises. Practice walking on leash and make sure your dog understands the leash pressure conversation. Practice your dog’s listening skills, especially while excited – controlled play is excellent for this. 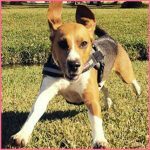 Practice meeting dogs in controlled settings – your friend’s dogs, social walks, dog training classes, even dogs you know and walk well with, set up little greeting sessions on the side. Be aware of your own mood. What can you cope with today? Are you feeling relaxed or a bit over threshold yourself? Set yourself up for success as well, and if you’re not feeling it, go ahead and do your best to avoid a confrontation. If in doubt, don’t. These strategies don’t mean we have to force our dog to try meet every dog it encounters. Please don’t do that. I don’t want to meet every person I see, and I don’t like every person I meet – so I do not expect my dog to either. If your dog doesn’t want to sniff and has no interest in the greeting, honour it. Walk on. Forcing it may tell your dog that they need to be defensive. Being able to occasionally say ‘hi’ on leash is a good skill to have and practice. Learning to work with the scenarios we have created in our urban and suburban lives is important, as they cannot always be avoided. Ultimately, most of us want our dogs to walk nicely with us, and tolerate other dogs nearby. Call me, I can help.